The first thing that comes to most people's mind when you describe a 5.56 cartridge is the ubiquitous AR-15 rifle. But the round is far more common than the famous Colt rifle, as evidenced by these Prvi Partizan made cartridges. 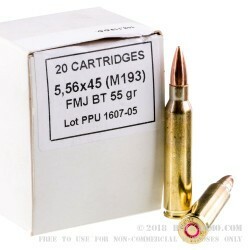 This 55 grain FMJ-BT ammo coming fresh off the line from the Russian Prvi Partizan factory, and although it was made on the other side of the world, they're ideal for use in an AR-15 or other .223 caliber semi-automatic rifles. 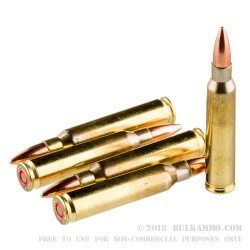 These rounds are made in the same dimensions as .223 but it's important to ensure your rifle can handle them. The M193 spec has a higher power load than standard .223 which may damage your rifle if it is not designed for the higher volume of powder. These 55 grain 5.56x45 FMJBT M193 cartridges produce 1,251 foot-pounds of muzzle energy, and leave the barrel at 3,200 feet per second. The boxer-primed brass is safe for reuse. The cartridges come packaged in 20 round cardboard boxes, with 50 boxes in this case. The boxes are also packaged in 200 round sealed plastic packs, with five "battle packs" in the case. Super impressed with fast shipping. great ammo , with a great price, quick service. I've shot over 2000 Rounds of this ammo through my Rock River National Match rifle. It's functioned flawlessly, the ammo is accurate, groups well, and shoots clean. This ammo is BRASS cased and BOXER primed so the cases can be reloaded. I've reloaded about 500 rounds so far using this brass and Barnes Varmint grenades, and those functioned flawlessly (not to mention what they do to pumpkins and other vegetables). and the brass is still in great shape and ready to be reloaded yet again. 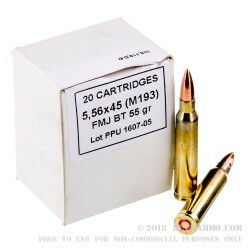 This is excellent, mil spec 5.56mm M193 Ammo. It has functioned flawlessly and clean in several AR's I have built. I disagree with Tim's review and question whether or not it should even be here. He bought the ammo elsewhere, yet it cycled flawlessly in his weapon, but he thinks it wouldnt be good for a weapon he probably doesnt even own? Something doesnt smell right. Buy this ammo. Great price. 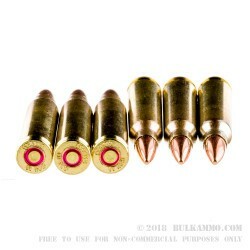 I had purchased 120 of these rounds at my local gun store for use with my rifle when I purchased my Bushmaster ACR and I personally am not going to use them again. While I did not have any malfunctions due to these rounds I attribute that more to my weapon than the performance of this ammunition. These rounds constantly flaked small bits of brass throughout the chamber of my ACR and further littered the lower receiver every time the bolt cycled. If my rifle did not have a gas piston I could definitely see these rounds causing issues with AR-15 style direct gas impingement weapons. Q: When was this manufactured? A: A majority of the ammo we sell will be manufactured within the last 1 to 3 years of the current calendar year. Some foreign surplus ammo manufactured decades ago will be noted in the item description and will usually fire without any sign of age. Q: Is this ammo lead or steel core? A: Prvi Partizan loads this 5.56x45 ammo with lead core bullets which feature a copper jacket. The rounds are loaded to the M193 NATO specifications.